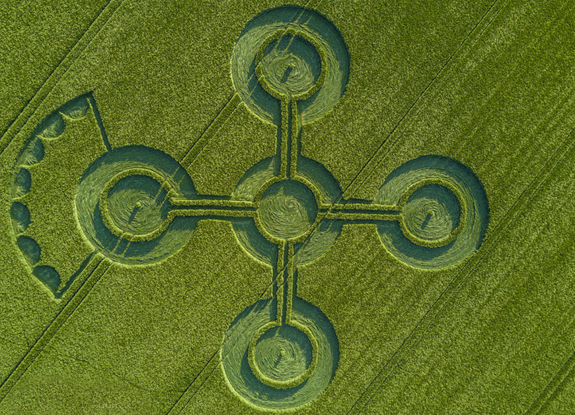 Could the Zetas say what this latest crop circle http://www.cropcirclecenter.com/ccdata/2017/05/25/UK20170525_A.html is telling ? Could the Zetas say what this latest Crop Circle is telling?. Alton Barnes, Wiltshire May 25, 2017. This legitimate Crop Circle design is depicting the daily Earth wobble caused by the near presence of Nibiru. The Figure 8, well established in 2004 when the wobble first began, has changed. The Figure 8 originated with what we called the Polar Push, an increasingly violent push against the Earth’s magnetic N Pole. This occurred when the Sun was over the Pacific and the N Pole rose over the horizon to face the Sun and Nibiru. Then the Earth would recover by the N Pole twisting first to one side and then the other and finally a bounce back into position. – the Polar Push and the bounce back. This WhiteHorse design is showing the quadrant arrangement of the original Figure 8 as well as how the daily wobble has CHANGED. The axis tilt to this and then that side is now incorporated into the position of the N Pole when in the midst of a Polar Push. In the past, prior to Nibiru’s entry into the Solar System, temperatures were determined by latitude, the distance from the Equator. During the Figure 8, Siberia and those parts around the Arctic pushed away from the warmth of the Sun during the Polar Push were colder. During the lean to the right and left, Alaska and Europe had unusually high temperatures. Now parts around the Arctic will REMAIN in the Polar Push position, while waiting for the bounce back that occurs when the Sun is over the Atlantic. In the meantime, HIGH TEMP spikes will result in Europe, Central Russia, and in Russia’s Far East. Now the increased wobble has created a duality, not the quadrant arrangement of the Figure 8 that had been present since 2004. The Polar Push wherein the N Pole of Earth is shoved away from the approaching N Pole of Nibiru continues to create cold temperatures in Siberia, where the magnetic N Pole of Earth currently resides. This has also warmed Antarctica, which is getting more sunlight. The Bounce Back is more fierce, so that Europe and eastern N America are also getting more sunlight, and thus the melting Arctic. What is missing is the temperature anomalies due to the tilt to the Left and Right. They have been lost in the more aggressive back and forth motion of the Polar Push and Bounce Back. You are asking the Zetas to PREDICT what the Council of Worlds will do! Thus question declined. Your curiosity is simply NOT the most important thing. Give you the game plan, because you are curious? And then again, the game plan is not in the Zetas hands, it is a Council of Worlds decision.Obviously, if the wobble were left as it, and the Earth not pushed, temporarily, into position for the Eclipse, it would raise a lot of questions. In the past, Eclipses have always shown something for those with eyes to see, but also allowed those in denial something to cling to. Thus, most likely, this will happen again. But I too do not speak for the Council of Worlds, just a Nancy guess. This new polar push will prove to be quite interesting when the Eclipse of Aug 21st arrives . Interesting trend on Nibiru. Is this a Prong 3 push twarads the announcement? Are we almost there? Are the talks how to break the truth about Nibiru intensifying? Zeta comment? Senator Telmário Mota drew the attention of parliamentarians during the session on May 25, announcing in a speech in the Senate Plenary the collision of an X7 planet, known as "Nibirú", with Earth. "I have received the information from an elect who said NASA states that the planet Nibiru is coming towards Earth and the current cycle will be over soon," said the senator. According to Telmário, the NASA report says that the planet changes the gravitational field of the earth and, with that, two thirds of humanity will perish. "Two-thirds will die of hunger and disease. I passed this to my advisers to do a study to see if this planet Nibiru is really approaching Earth, "he announced. The video of the senator's speech quickly turned into social networks and was shared by thousands of Internet users, who criticized the senator's position, saying that the senator should bring more relevant issues to the Plenary. will vary by country and culture, likewise honesty about the nearby presence of Nibiru and the pending passage will vary. Where these concepts are aggressively denied and even punished, the public will be slow to openly discuss them. Because of the reach of the Internet, open discussion will spread like an infection, and eventually like an explosion. Meanwhile, the cover-up will increasingly feel under attack and try to counter-attack with disinformation. But the trend is not in their favor. Declined. Between the changing wobble and plates splitting apart - both of which can cause waves or adjustments in water levels - the whole world will have unusual things happening. From too much hail to sudden deluge or high winds, unexplained. From high tides to dying animals. Do you seriously think I and the Zetas have time to do more than we have already done, already laid out for you to understand the dynamics? Oh, there was an odd little wave off shore! Quick, ask the Zetas! I am SCOLDING you as my time is being compressed, and you are absolutely asking for what we call "hand holding". Shame on you. As is our usual practice we are closing this 6/3 Q&A so answers can be prepared for the web. Please post your new questions on the chat for 6/10. Thank you.